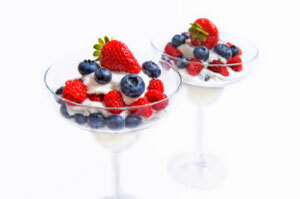 Effortlessly impress with this refreshing and patriotic dessert at your next summer celebration. Wash fruit and slice strawberries. Scoop frozen yogurt into martini glasses and top with fresh fruit. For added 4th of July spirit, top with red, white and blue sprinkles or little United States toothpick flags.